If your downloads are taking forever, try these 12 turbo-charging tips. The best way to improve your download speeds is by installing a program like Free Download Manager. This splits files into several sections so each individual piece can be fetched simultaneously, making file transfers up to 600 per cent faster. It can also schedule downloads, resume broken transfers, play partially completed audio and video clips, download and convert web videos, and handle BitTorrent files. If you access the internet via Wi-Fi, you may not be getting the fastest possible download speeds. Try connecting your computer directly to your router using an Ethernet cable. You may find you get noticeably better results. 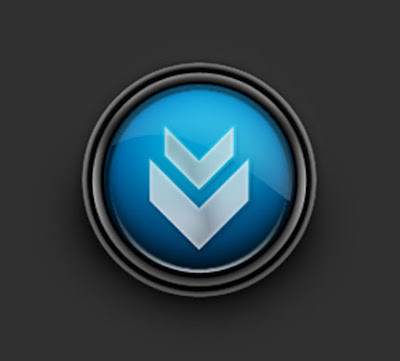 Most BitTorrent programs give you control over your upload and download speeds. Ideally, for the fastest transfers, you should set your upload speed to around 80 per cent of your broadband's actual upload capacity, and your download speed to around 95 per cent (not unlimited). 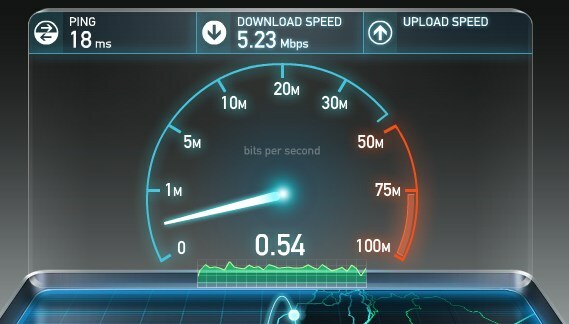 You can work out what the figures should be by first measuring your connection speed at www.speedtest.net. Many ISPs automatically throttle BitTorrent downloads, preventing you from getting your best possible speeds. uTorrent can disguise BitTorrent traffic, making it harder for your ISP to spot. To turn the feature on, go to Options, Preferences, BitTorrent and select Enabled in the Outgoing box. It's also worth changing the default port, which you can do in Opt ions, Preferences, Connection. Other BitTorrent programs offer similar options. Before downloading large files, make sure you turn off or disconnect any devices that might be using your internet connection, such as games consoles, other computers, tablets and mobile phones. To maximize the download speed, you should also temporarily avoid using you r computer for other internet tasks, such as streaming video or making Skype calls. Uploading files can also reduce your download speed. Free YouTube Download (http://bit.ly/fytd284) lets you quickly download individual YouTube videos, entire playlists, every video in a user's channel, video responses and more. It can also convert them into different video formats, such as AVI and WMV. Sometimes downloading a program from the developer's site isn't the quickest option. You'll probably find you can get it in a fraction of the time from a dedicated software hosting site such as Download.com or MajorGeeks.com. The Chrome add-on Cloud Save ( http://bit.ly/cloudsave284) lets you right-click items on a page and download them to a range of popular online storage sites including Dropbox, Google Docs and SkyDrive. Once a file has downloaded, it will be accessible on any connected computers and devices. Some sites offer a choice of download locations around the world (called mirrors). Picking the nearest one - in London or Europe, rather than in the US or Australia - can save a considerable amount of time because the data will have less distance to travel. Downloading large games through Steam can often take hours. The speed you get typically relies on server load (although distance is also a factor). The busier a location is, the slower the download will be. To solve this problem, go to Steam's Content Server Stats page (http://bit.ly/steam284) and find a location that has the least number of users but is reasonably close. Open Steam, go to View, Settings and click Downloads + Cloud. 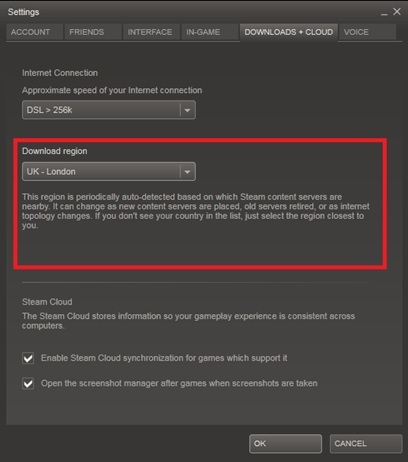 Select your new download region, and restart Steam. JDownloader can speed up any kind of download, but it's particularly well suited to hosting sites like Fileserve and Megaupload. Add a file link and JDownloader will automatically download it once the waiting period has expired, even filling in some CAPTCHAs for you. 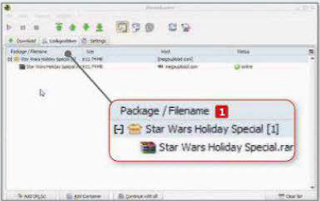 It can download several files simultaneously and extract compressed files from RARs once the download has completed. Follow our Mini Workshop, right, to learn how to use JDownloader. Make sure you pick the offline version rather than the web installer and choose the custom install method to avoid unwanted add-ons. 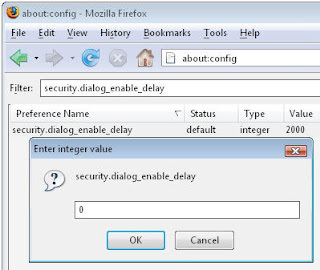 Firefox add-ons are tiny and don't take very long to download or install, but there is a built-in waiting time that adds several seconds to the process. To remove this delay, type 'about:config' (without quotes) into the address bar and search for security.dialog_enable_delay. Double-click the entry and change the value to 0. Launch the program, and then find a file you'd like to download from a hosting site such as Megaupload. Copy the URL of the file and switch to JDownloader. The file should appear under Package/Filename. (1) You can repeat the process and add links to further downloads if you wish. Right-click the file name and select either 'Continue with all' or 'Continue with selected links'. (1) A window will appear asking you to accept the hosting site's terms of service. Tick the box in the window and click OK. Some sites require you to wait for a short while or manually enter CAPTCHA details.